1. In a skillet, heat butter over medium high heat until melted and starting to bubble. Add diced mushrooms and onions. Cook, stirring frequently, until onions are translucent and mushrooms are shiny, about 5 minutes. Add Marsala wine and cook for an additional 3 minutes. Remove from heat and set aside. 2. Place ground chicken in a large bowl. Add salt, oregano, bread crumbs, egg, and cooled mushrooms, onions and any remaining marsala juices. Knead ingredients together with clean hands until evenly mixed. 3. Form season chicken into 1 1/2" balls and place on a grease baking sheet. Bake at 400˚for 25-30 minutes. 4. 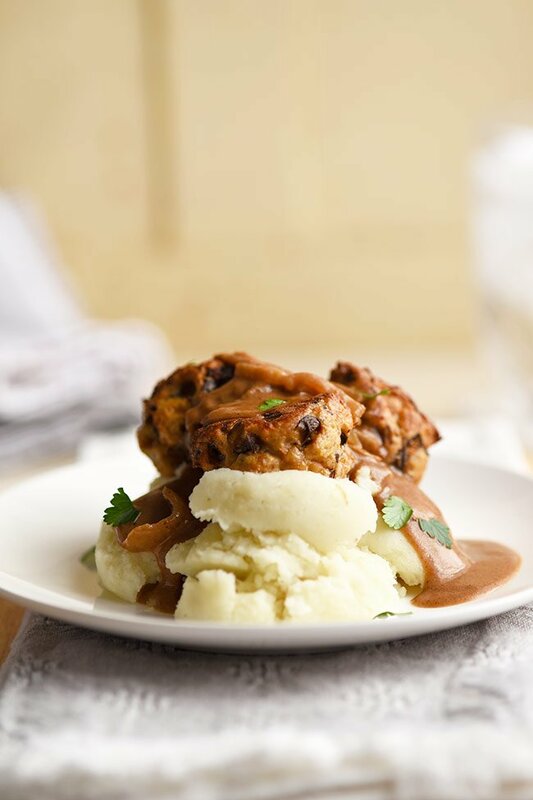 While chicken marsala meatballs are cooking, prepare the gravy by first heating butter over medium high heat in the skillet use to cook the onions and mushrooms. Once butter starts to bubble, whisk in flour. Let cook for 1 minute then add marsala wine and chicken stock. Bring to a boil then add half and half. Stir until thickened then remove from heat. 5. 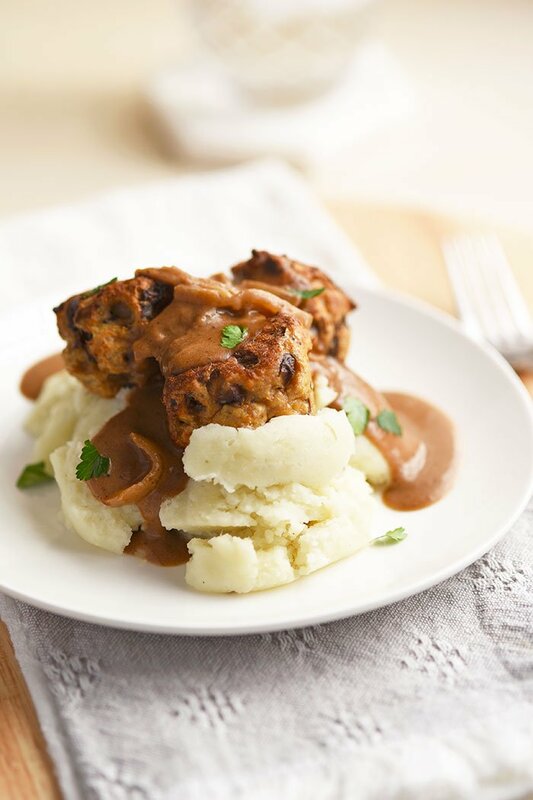 Serve chicken marsala meatballs with gravy from a small crockpot as an appetizer, or serve over mashed potatoes with a side of green for a full meal! Ya’ll know how I love mushrooms. So I just had to put them in some meatballs! 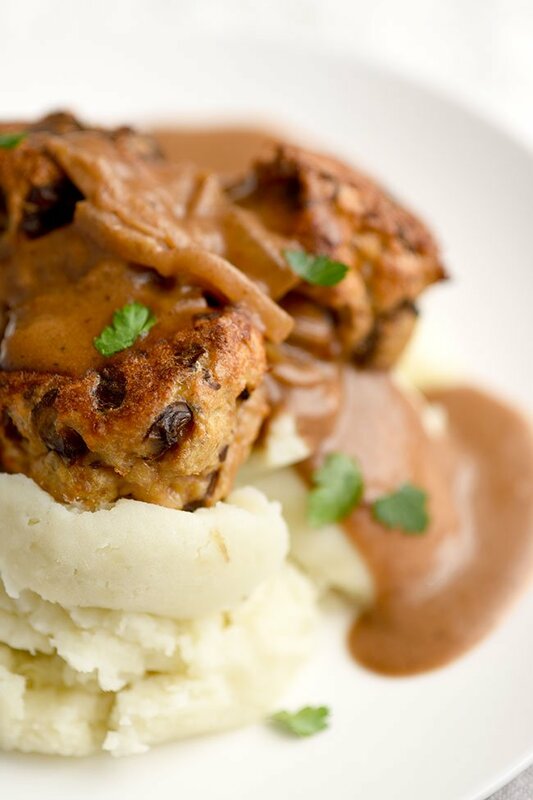 Specifically, Chicken Marsala Meatballs. Ever wondered what people make with ground chicken? Meatballs. That’s what they make. And “they” can now be you. Don’t be scared. Cooking ground chicken isn’t as terrifying as it sounds. It’s quite delicious, actually. First time ground chicken eaters, you might have a few questions. Like, is ground chicken healthy? Is it healthier than ground beef? Does ground chicken even taste good? They make ground chicken?? Yes is the answer to all those things. Ground chicken is less fatty than ground beef however, it’s also less flavorful. So adding flavor is key when cooking ground chicken. Ground chicken is not hard to come by. 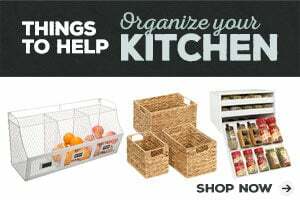 You can typically find it at any grocery store in refrigerated meat section. Just like whole chicken, you’ll need to be careful to wash your hands after handling raw chicken, clean up work spaces with disinfectant and take any other precautions to not ingest raw chicken. Since you’ll be forming the meatballs with your hand, I recommend taking off any jewelry before hand and when you’re done clean out under your nails thoroughly with soap and water. How do you know ground chicken is cooked? Maybe it’s just me, but this is something I was worried about when using ground chicken for the first time. It’s ground so the usual way to test for doneness by checking for any pink color, doesn’t really work. The best way to check and see if your chicken is cooked is to take its temperature using a meat thermometer. You want to get to a temperature of 165˚to be safe. Read more about cooking temperatures of chicken and other meats here. Let’s talk about the fun stuff now. The flavors! You’re going to incorporate a drool-worthy combination of mushrooms, onions, marsala cooking wine, and oregano right into these meatballs. These ingredients play off of each other to give you an earthy, creamy yet semi sweet caramelized flavor. Then there’s the sauce. The sauce contains much of the same flavors, it just add moisture and acts as a gravy. You can serve these chicken marsala meatballs over pasta, egg noodles, or mashed potatoes. Serve with a salad or some roasted veggies like Brussels spouts or asparagus for a complete meal. So good, and really easy! If you’re going to go ahead and purchase a bottle of marsala wine then I’ve got other recipes for you to try! Check out my delicious french onion soup and my easy creamy Swedish meatballs recipe. In a runt? Browse my other delicious dinner ideas! 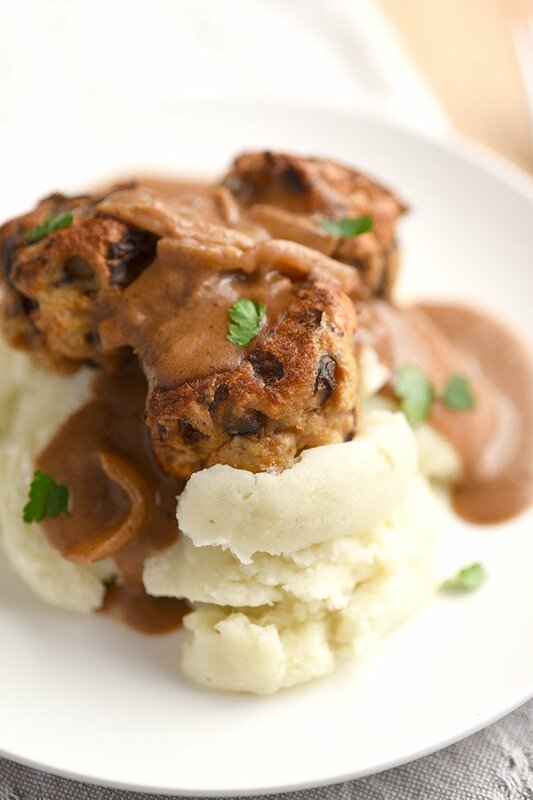 This Chicken Marsala Meatballs recipe was featured on the Country Cook’s Weekend Potluck and Happiness is Homemade!